This is part 2 of a two part series. Read more about Fog & Edge Computing in Part 1. In Part 1, we took a look at Intelligent Transportation Management systems and Industrial & Commercial Networking. In Part 2 of this, we’ll examine Smart Metering and Autonomous Vehicle applications and highlight where Edge and Fog computing could fit in each application. Smart meters are among the most ubiquitous edge devices deployed in the world today. Smart meters generate immense volumes of data, which creates a challenge for application architectures performing analysis in the cloud. In order to alleviate some of the strain caused by high data rates, a fog solution could be to deploy local data centers alongside transformers (or other devices managing multiple Smart Meters) and filter data from multiple Smart Meters in a central location, within the local area network. A more efficient way of dealing with this flood of sensor data, however, would be to process data at the Edge, filtering data on the actual Smart Meter. This is more efficient for several reasons. Firstly, by processing data at the edge, redundant or irrelevant, “noisy” data can be filter at the source. This means only relevant data is ever transmitted over the local network, significantly reducing required bandwidth and reducing (or eliminating) the need for additional storage at the transformer level. Secondly, there are cost benefits, as there is no need to install and administer additional IT infrastructure in the field, the compute and memory available on the Smart Meter, itself, is sufficient. Lastly, Smart Meters leveraging Edge Computing can be updated and managed remotely, whereas Fog solutions may require hardware updates by field operators. In order for autonomous vehicles to operate successfully, they require a great deal of machine intelligence operating locally, and all in real-time (it’s not very helpful to respond to a potential crash situation after 30 seconds of buffering…). Autonomous vehicles are among the most complex Edge devices deployed today, constantly responding to dynamic environments and making thousands of computations every second. They apply Artificial Intelligence (AI) principles to real-world scenarios and must respond, all without relying on connectivity or the cloud for added computational horsepower. Edge computing enables autonomous vehicles to perform AI at the Edge, ensuring the lowest possible latency between data generation and actuation of vehicle systems. You would think, since autonomous vehicles are mostly closed loops (ie. all computations are happening locally, within the vehicle itself) that Fog may not be as useful autonomous vehicle applications. However, as governments and technology providers continue to develop smart traffic infrastructures, it will become possible for infrastructure to interact directly with autonomous vehicles. Local data centers can be deployed alongside traffic infrastructure to help manage these interactions. Individual vehicles will continue to perform operational computations locally (ie. at the Edge), however connected infrastructure may create a mesh network, providing local connectivity to multiple vehicles and aggregating information from them in the Fog, providing more detailed context to the individual vehicles based on the aggregated traffic data. 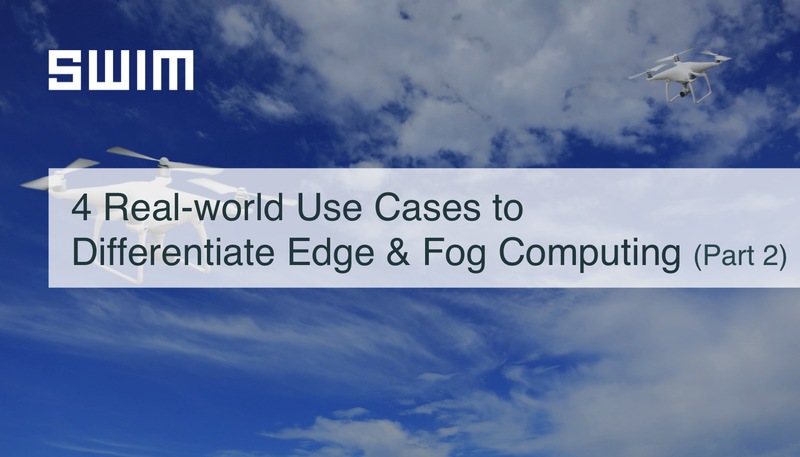 Read more about Fog & Edge Computing use cases in Part 1 of this series. Learn how SWIM uses Edge Computing to optimize and alleviate the sensor data overload. Swim ESP can help transform and manage sensor data using Machine Learning to intelligently filter and act on data created by edge devices in real-time.